The company will send me for a firefighting course. I chose to take the course end of May hoping to get some nice spring/ summer weather. 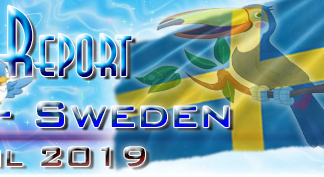 They wanted to send me to another course as well, and I could choose a course in Gothenburg in the beginning of May as I wanted to see the Crane Dance and end of April is too late for the Crane action. 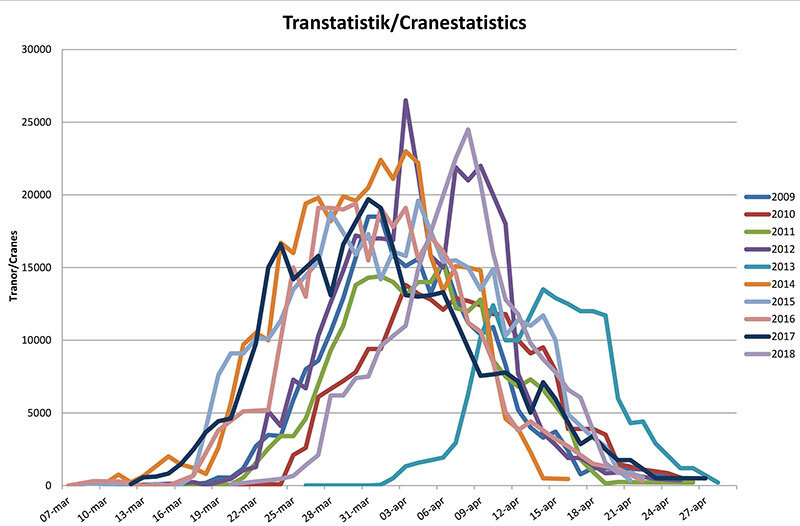 I sent an e-mail to Naturum Hornborgasjön and I got a statistic over the Cranes at the Lake Hornborga/ Hornborgasjön. And in mid April there are still chances to see the Crane Dance. And as I will be there in the middle of the April I was thinking about the Black Grouse Lek. I searched the internet for information about the Black Grouse Lek and I found two companies. Nordic Safari and Wild Nordic. I found out that the Black Grouse Lek are starting in March and I can see it until end of April. Actually it goes on in to the month of May but as the soil has thawed after the winter and the swamp turns in to a, well, yes, a swamp and we cannot stay in the swamp. I also found out about Capercaillie Lek, something I really wanted to experience as well. I had now booked both Capercaillie Lek and Black Grouse Lek and it would be 5 nights in a tent on a frozen swamp. I was soon running in to a set-back, Wild Nordic could not to the Black Grouse Lek trip as the road was closed to the swamp. I had to find another tour company in Tiveden, Natur Guide Tiveden. I found that they were doing both the Capercaillie Lek and the Black Grouse Lek. So now I was set up for 3 nights with the Capercaillie and 2 nights with the Black Grouse and I will go to look for beavers, owls and moose as well. I will spend a few days at Brandområdet before driving south again. I will stop at Tiveden National Park on the way to Gothenburg where I will do my first course. When I finish my course in Gothenburg I will drive to Öland for a few days of bird watching before driving to Skåne for more bird watching. End of May and I will drive back to Gothenburg and the firefighting course on öckerö in the archipelago and I hope to be able to see some exciting bird life there. Tiveden and Nordic Safari, well, I booked different trips on top of the Capercaillie Lek and the Black Grouse Lek and I will have a Guide. I was looking for Guides on Öland and it was not easy. I wrote to Ölands ornitologiska förening and I got a recommendation for 2 Guides, both offering boarding and Guiding. • SVALGÅRDEN - WE OFFER ACCOMODATION AND BIRDGUIDING N KVINSGRÖTA, ÖLAND! • Segerstad's lighthouse - Welcome to the best birdwatching accomodation on Öland! The Crane Dance will be without any Guide. I will also do Brandområdet and Skåne by myself and no Guide is necessary. I recommend the AOT or any other taxi service if you are leaving early morning. The price per trip is 1200 Baht comparing to around 220 Baht + about 80 Baht road toll. But the taxi can easily be 1000 baht if you´re getting desperate when not finding a taxi. Early morning flight and it can be a hassle to find a taxi that want to take you to the airport so I book AOT and the car wait for me outside my apartment. Leaving Suvarnabhumi and AOT have desks in the luggage claim area, where I use to book my car while waiting for my luggage. There are also desks just outside the custom and you cannot miss them. Arriving to Suvarnabhumi International and they have TAXI Meters leaving from the ground floor. It is quite organised and I was surprised the first time I used a TAXI meter from Suvarnabhumi back home. • Public taxi stand is located on Level 1 (Ground Level). • Contact Taxi counter, Level 1 – Ground Level, near entrances 3, 4, 7 and 8. • Receive a ticket from a taxi queue machine, proceed to the lane number printed on your ticket. • Taxi fare: metered taxi fare plus 50 Baht airport surcharge, and expressway fees. 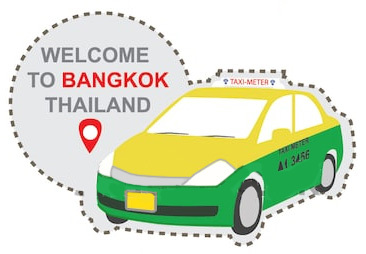 • Public taxis serving Bangkok’s Suvarnabhumi airport must be less than 5 years old. • Public taxi drivers must be certified by Airports of Thailand. • Passenger drop off at Departures (level 4 – outer curb). The train is quick but it can be a bit of a hassle to ride the train as they are often full and people are having a lot of luggage. So if I can I take the buss. Nettbus Bus4You and Nettbuss express is operating traffic to a number of destinations in Norway, Sweden and Denmark. If there is a buss I choose the buss. It is as quick as the train. Not many passengers and you keep the luggage in the cargo hold. But they only departs 3 times per day so you need to be lucky. Even the train is better than to wait for a the buss for a few hours. Sweden in April and May, could be summer and it can be winter, or anything in between.In the South I hope to have sunshine and the summer in good progress. I will be in the middle of Sweden to watch the Crane Dance and the Capercaillie Lek and the Black Grouse Lek. The lek is going on until May but they usually give up watching when the the soil has thawed after the winter and the swamp turns from hard to water and it is not possible to be there any more. So yes, I have ordered thermo underwear for my nights in the tent. And coming to Skåne and Öland I might be lucky and I can walk around in shorts and shirt. But it can as well be winter and I need to pack a lot of clothes this time. Visiting in the spring time and you really need to pack a huge bag. In the morning it is below zero so I have packed full winter equipment, parka jacket, warm hat and gloves. And of course warm socks. In the late morning you will have to change the winter clothing to “spring” clothing, a wind breaker. If it is sunshine the temperature is easily reaching 20°C at lunch time and that can easily be almost 30°C. If you have a car it is no problem, just keep everything in the car and change as the day proceeds and you ae ready for any weather changes you will run in to. Naturum Hornborgarsjön Excellent information about Lake Hornborga/ Hornborgasjön - IN SWEDISH ONLY - Very disappointing - But you will find some of the information that I will translate if you continue follow my bird watching trip in Sweden. Visit Öland - The top 20 birding sites on Öland with maps and information - Excellent page! And the web page you cannot live without. I have been around the world looking for birds. I usually have a Guide, but sometimes it is not possible to find a Guide. So, well, I have lost count onhow many times I have had help to ID birds at BirdForum. 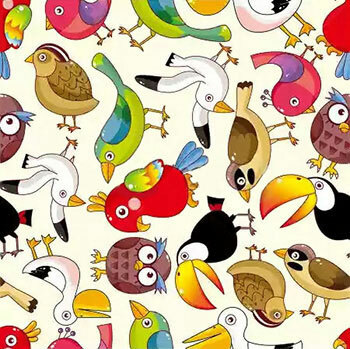 Joining this forum have been very very good for my bird watching experience. 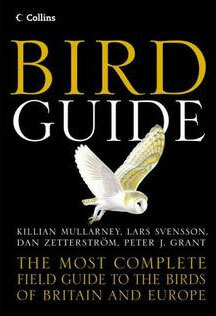 The Collins Bird Guide is a field guide to the birds of the Western Palearctic. Its authors are Lars Svensson, Killian Mullarney, Dan Zetterström and Peter J. Grant, and it is illustrated by Killian Mullarney and Dan Zetterström (with two plates of North American passerines contributed by Larry McQueen). It has been described as "undoubtedly the finest field guide that has ever been produced", and "the last great bird book of the 20th century". It was originally published in Swedish and Danish in 1999, and in English in hardback in the same year, and later in paperback. A large-format English edition has also been produced, as has a German and Dutch edition. The first edition was translated to 14 European languages, including Spanish, Portuguese, French, Dutch and German. A second edition, revised and enlarged, was published in January 2010. A series of updates and corrections were made in 2015, with no change to the edition number. The cover of the first edition, in all formats, depicts a barn owl. On the second edition, this was replaced by an arctic tern. Eleven pages of introductory material are followed by the book's main content: 366 pages of text and colour paintings. The text for each species gives brief status notes, followed by a section detailing identification, and concludes with a section on voice. Accompanying most species accounts is a small colour map showing breeding, wintering and migrant range. The guide is also available as a paid-for app, for iPhone and Android devices. The app includes all of the text and images from the print edition, as well as audio recordings. Additional data can be bought separately; the first such package being a set of distribution maps for 271 species, from the British Trust for Ornithology's Bird Atlas 2007–11. All versions cover Europe, North Atlantic islands, much of North Africa and the Middle East. Most of the species covered in the main part of the guide are regular breeding, wintering or migrant species in its area of coverage, although some vagrants are also included. There are additional sections giving brief accounts of (a) vagrants and (b) introduced breeding species and species recorded only as escapes. Lake Hornborga (Swedish: Hornborgasjön) is a lake in Västergötland in Sweden, famous for its many birds, in particular the many cranes that stay here temporarily during their annual migrations. Lake Hornborga was created after the last ice age, approximately 10,000 years ago. The area has been settled since the Stone Age. In order to relieve starvation, it was decided in 1802 to lower the water level in order to create pastures for cattle to graze. The water level was lowered a further four times after this. The surface area was reduced from 28 km² to less than 4 km², but rather than make way for pastures, reeds took over and turned the lake into a swamp. Throughout these reductions, the lake remained a popular habitat for birds, but the last reductions in 1933 also reduced its attraction for birdlife. In 1965, a Government investigation suggested that the lake be restored, and between 1992 and 1995, the water level increased by an average of 0.9 metres. During the restoration, 1,200 hectares of reed and 800 hectares of trees were removed, and animals were reintroduced to graze the shores of the lake. Tiveden is a forest in Sweden, throughout history notorious for its wilderness and dangers; historically a hiding place for outlaws. Within it, the Tiveden National Park has a designated area of 20.3 km, a comparatively small and arguably the most inaccessible part of the forest. 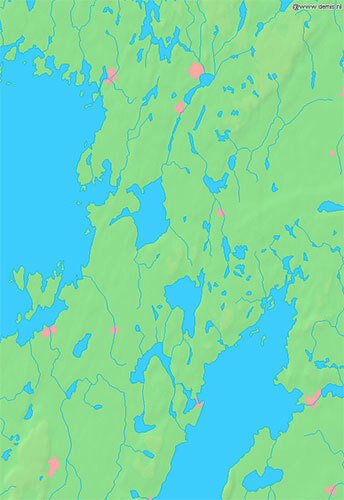 It was established in 1983, and administratively belongs to the municipalities of Karlsborg and Laxå. The name is very old and disputed. -Ved is cognate to English Wood and the first part of its name, Ti-, either means "god" or refers to the god Týr. Tiveden separates Närke from Västergötland, and was formerly a frontier between the Geats and the Swedes. The national park area has never been inhabited, but there are several ancient remains of human activities such as worshipping grounds and sacrificial sites. 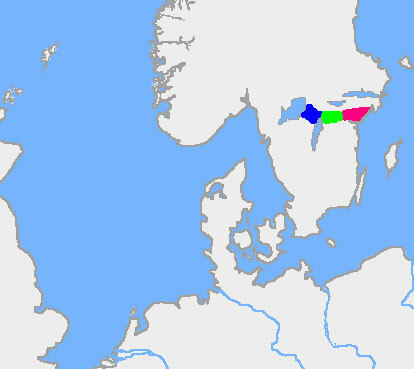 The old forest border between Swedes (Suiones) and Geats. At the lake of Fagertärn, there was once a poor fisherman who had a beautiful daughter. The small lake gave little fish and the fisherman had difficulties providing for his little family. One day, as the fisherman was fishing in his little dugout of oak, he met the Nix, who offered him great catches of fish on the condition that the fisherman gave him his beautiful daughter the day she was eighteen years old. The desperate fisherman agreed and promised the Nix his daughter. The day the girl was eighteen she went down to the shore to meet the Nix. The Nix gladly asked her to walk down to his watery abode, but the girl took forth a knife and said that he would never have her alive, then stuck the knife into her heart and fell down into the lake, dead. Then, her blood coloured the waterlilies red, and from that day the waterlilies of some of the lake's forests are red. The animal life is scarce, but the forest houses a substantial population of western capercaillie. Hälleskogsbrännan nature reserve, Västmanland, Sweden. The reserve was established in 2015 to observe the development of the ecosystem in the area following the large 2014 Västmanland wildfire. 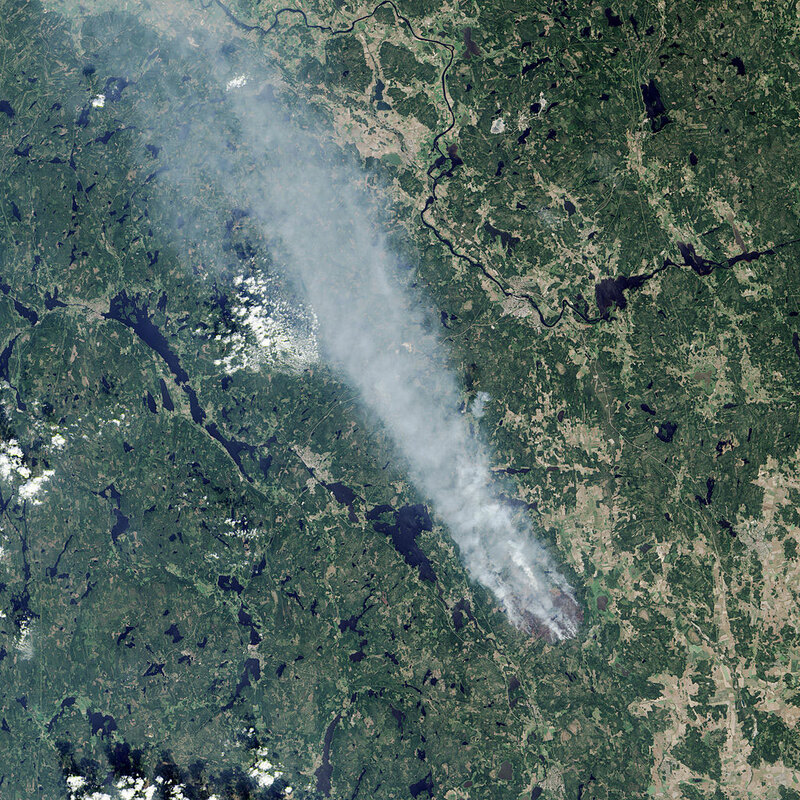 The 2014 Västmanland wildfire (Swedish: Skogsbranden i Västmanland 2014) was a wildfire that broke out on the afternoon of 31 July 2014 on the border between Sala Municipality and Surahammar Municipality in Västmanland, Sweden. 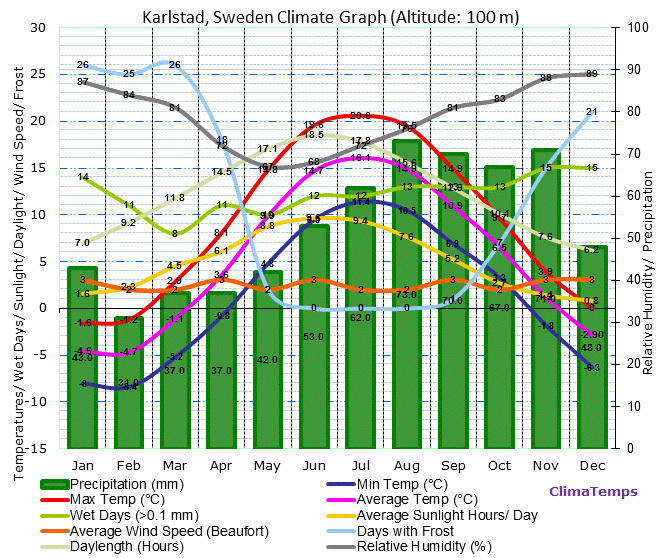 It is Sweden's largest wildfire in 40 years. After an EU appeal, Italy and France provided firefighting aircraft. On 4 August 2014, the evacuation of residents began in Gammelby alongside Route 668 east of Lake Virsbo, Västervåla and Ängelsberg. 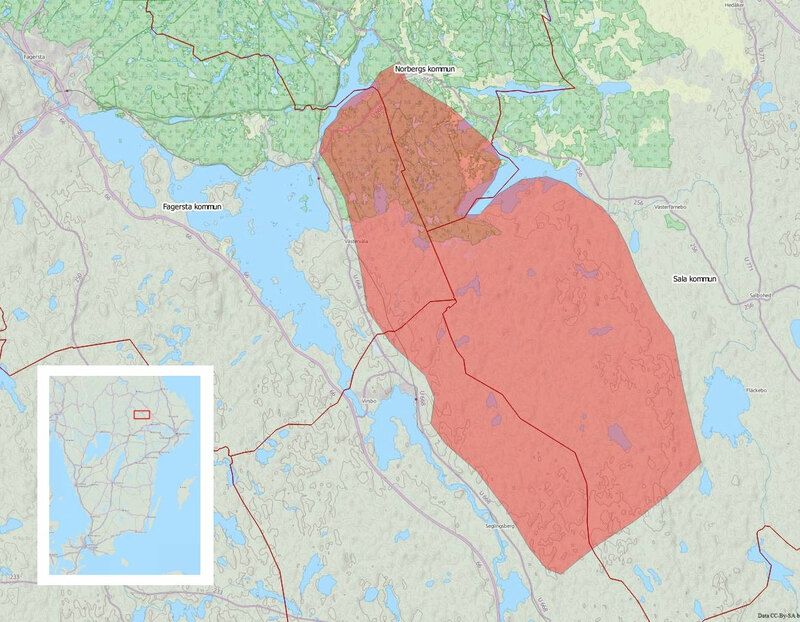 As of 5 August 2014, over one thousand people were forced to evacuate their homes, and the town of Norberg, with about 4500 residents, was being considered for evacuation. One person was confirmed killed by the fire, a man in his 30s who was reported missing. His badly burned body was found near Stabäck, Västmanland. The fire was declared a national emergency. It encompassed over 15,000 hectares and was located northwest of Sala. The Swedish Armed Forces were mobilized, with about 100 personnel providing support to the firefighters as of 7 August. It was reported that nine volunteers were surrounded by fire and had to be rescued by professional firefighters on 5 August. Because of this, volunteer firefighting help from the public was no longer accepted. Firefighters found a 42-year-old man in the forest who was badly burned but still alive. The police reported that he was taken directly to a hospital for treatment. The wildfire threatened the UNESCO World Heritage Site Engelsberg Ironworks. The owners of the Ironworks, Nordstjernan, rented two helicopters of their own to water the area close to the site. The Swedish police started a preliminary investigation of the cause of the fire, to see if it was caused by criminal negligence. According to local media, a driver of a ground-preparation vehicle stated that the fire started in his vehicle and that no fire watch was posted despite a very high risk of fire. 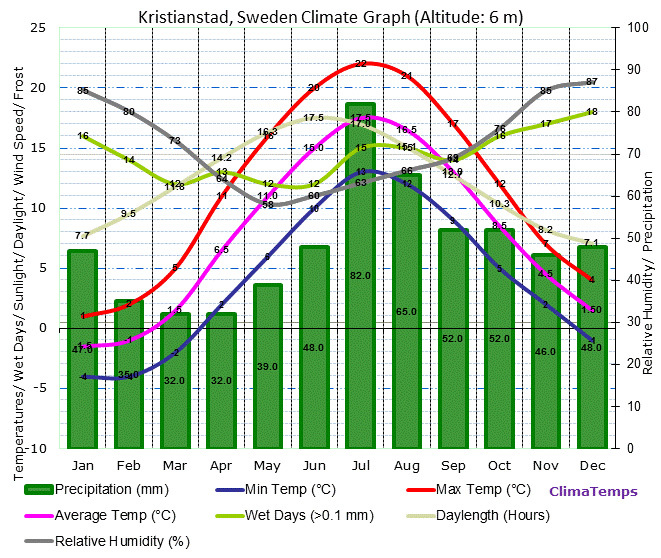 Although the 2014 Swedish heat wave did not cause the fire, the exceptionally hot and dry conditions of the summer of 2014 enabled the fire to spread and intensify. Öland, the long island in the southern Baltic Sea, has everything the visitor needs to ensure a steady stream of new encounters with birds. The whole island of Öland could justifiably be described as a single fantastic place for birding, one big birding location, with migrating birds the year around and with a unique and spectacular environment. Here we will describe 20 birding locations that together well covers most of the richness that characterizes Öland bird fauna. The selected birding locations have all in common, that they are easy to find, to park at and can handle high visitor pressure. Some of the sites are bird sanctuaries with restricted access during parts of the year, however, the County Administrative Board of Kalmar has arranged so that there are marked trails and areas where it is possible to be the year around. Known in Latin as Oelandia, and sometimes written Øland in other Scandinavian languages, and Oland internationally) is the second largest Swedish island and the smallest of the traditional provinces of Sweden. Öland has an area of 1,342 square kilometres and is located in the Baltic Sea just off the coast of Småland. The island has 26,000 inhabitants. It is separated from the mainland by the Kalmar Strait and connected to it by the 6-kilometre Öland Bridge, which opened on 30 September 1972. Discover the wonderful Österlen with its rolling meadows and picturesque communities. The concept Österlen is not even one hundred years but its content goes way back. No one really knows where the limit of Österlen is but generally speaking one can say it is the southeast Skåne where among others Simrishamn, Tomelilla, Kristianstad, Bromölla, and Ystad are included. Skåne is part of the most important European route for migrating birds. Explore on an eagle safari, or watch the gracious dance of the cranes. The Falsterbo peninsula south west of Malmö is one of the most important bird migration routes in northern Europe. Around 500 million birds pass this spot on their way to spend winter in Africa. Every autumn, the area around Falsterbo Lighthouse attracts thousands of birdwatchers, with 359 species passing through. Climb the birdwatching tower on the roof of Falsterbo Strandbad and admire the birds around the beach, sea and heathlands. While you’re there, drop in to the Naturum visitor centre for birdwatchers. Start at Mölle and hike up towards Kullen lighthouse. Kullen boasts a rich birdlife. This is due to the many different environments existing on the hillside, but also its geographical location between two vegetation zones in Europe – the central European deciduous forest and the northern boreal coniferous forest. The guided bird hikes start from the lighthouse and can be booked in advance or alternatively arranged on a drop-in basis. There can be large numbers of migrating and resting birds. Bring along your binoculars. The guide has a telescope which you can look through to spot birds at a distance. But the list can come in handy to find out the local name of the bird etc. And Avibase have a list with pictures and sounds, excellent! So I have 4 different checklists from different parts of Sweden below.